MO 152 Road Exit I-29. Photo courtesy of formulanone. As most of you have probably noticed by now, construction work has begun on Route 152 and I-35 Interchange. If you thought the traffic on Kansas Street couldn’t get any worse, think again. Lane closures have begun, causing large backups and delays on Kansas Street. Here is a brief overview of everything you need to know about the changes coming to the 152 Interchange, how long it is going to take and how it will affect students and faculty here at William Jewell College. 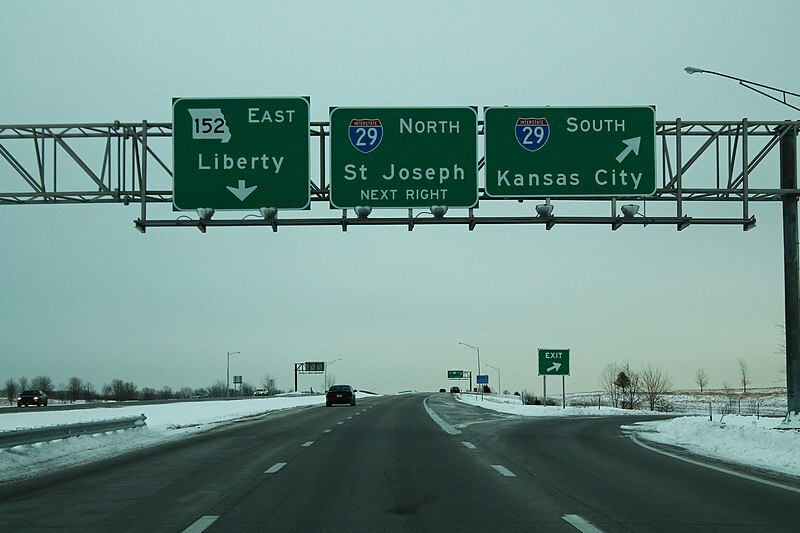 The Missouri Department of Transportation (MoDOT) began work towards improving the Route 152 and I-35 Interchange back in early March, but lane closures on both I-35 and Route 152 began in the last few weeks. While this will cause extra traffic and inconvenient delays, especially on Route 152, this project will improve development, efficiency and traffic safety in the long run, according to MoDOT. A simulation of what the interchange will look like can be found here, but essentially, MoDOT will work on widening the street, adding turn lanes, repairing the bridge and adding bike lanes. “The project will also add a multiple-use path along the south side of Route 152 and Kansas Street which will extend across the I-35 bridge,” states MoDOT’s website for the project. All of this work is estimated to cost about $30 million and is being paid for by MoDOT, the City of Liberty and Kansas City, Missouri. Anyone who has driven down Kansas Street or Route 152, especially during rush hour, has a pretty good understanding of the problems, and MoDOT is aware of that as well. Bumper-to-bumper traffic, backed up turn lanes and overall unsafe driving conditions are common on Route 152. “The Route 152 bridge really needs to be replaced – it’s reached the end of its life expectancy,” said Markl Johnson, a spokesman for MoDOT. The goal of this project is to fix all of these problems. “[These improvements will] create a safe, efficient, environmentally sound, and economical transportation facility that meets the needs of the area,” said MoDOT on their website. MoDOT predicts that a more efficient and safe main road in Liberty could potentially do wonders for the development of the city, as well as the safety of the drivers. There is a lot of work that needs to be done to achieve these goals, and MoDOT suspects that the project won’t be completed until August 2020 – about a year and a half from now. While there will be lane closures on Kansas Street and I-35 for most of that time, the bridge going over I-35 will only be closed for a span of four months, starting in May and ending in August. Luckily for Jewell students, most of that closure will take place over summer vacation, so it shouldn’t cause too many problems. However, the lane closures continuing into next year will have a tremendous impact on students, as Route 152 and the I-35 Interchange are critical junctions for the city of Liberty. For students who use Route 152 to get to work or other activities, they should plan to leave earlier than usual in order to get to their destinations on time. It is also important to drive with extra caution in that area. There are several possible ways to avoid this construction. MoDOT has detour maps for traveling westbound and eastbound on Route 152, likely for when the bridge is closed, but there are other ways to avoid the annoying lane closures, traffic and construction if you want. If you want to get on I-35, I would recommend taking North Lightburne Street past Liberty Hospital to I-35. If you are heading northbound on I-35 on your way to Jewell, you could also go past the Route 152 exit to exit 20, which will put you on North Lightburne Street. Using Route 291 is another possible way to avoid all of the traffic and construction. For anyone who has to drive down Route 152 on a regular basis, this next year and a half could potentially feel like an eternity. The traffic is going to be worse than usual, as drivers will have to deal with closed lanes and construction. However, MoDOT predicts that the temporary increase in traffic will be worth it. “This project will accommodate development, and most importantly, improve traffic safety,” according to MoDOT. For most people, driving on Kansas Street has often been a nightmare. By the fall of next year, that could change.